Why not grow Runner or French Beans? If you are short of ground space or want to get the maximum vegetable yield from a small area why not plant some beans, they must be the ultimate and one of the easiest vertical vegetables to grow as well as looking very attractive, the bees love the flowers too. Beans are perfect for children to sow and grow, capture their imagination in the garden with stories of Jack and the Beanstalk when you sow your ‘Magic’ beans, they are easy to germinate, and fascinating to watch as they quickly grow spiralling round and round canes, supports or netting. There are many varieties of Runner and French Beans available, producing white, lemon or orange flowers and green, white, yellow and even purple pods, both Runner and French Beans are available either as tall climbing or dwarf bush varieties. 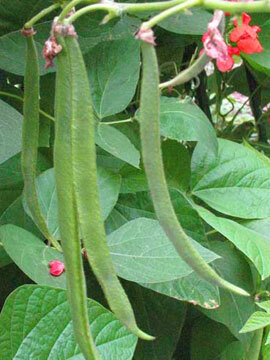 Dwarf Runner and French Beans are quicker to flower and will produce an earlier crop than the Climbing varieties. Early sowings of seeds can be made from April onwards in pots indoors, outdoor under cloches in May or direct where they are to grow until the end of June early July. Plant the seeds so that the ‘eye’ points downwards or to the side, germination takes between 7-14 days. Successive sowings will ensure a long harvesting period well into the Autumn. Dwarf varieties can be grown in containers or even hanging baskets they need little or no support, whilst climbing varieties need tall and sturdy supports, either canes, Runner Bean support or netting, the plants can be quite heavy when laden with beans. Beans prefer a moist rich soil and a sunny and sheltered position, dig in plenty of organic matter in Autumn and apply a general purpose fertiliser a couple of weeks before planting out. Use good compost in containers adding Rain Gel Water Storage granules to maintain the moisture and prevent them from drying out too quickly. Beans are tender, harden off and plant out after all risk of frost, protect with fleece on cold nights. Be prepared Slugs and Snail love tender bean plants apply Slug Gone around plants or Nemaslug to the soil. To get a good crop keep the soil moist, once the pods have formed water often especially in dry weather, container grown plants will benefit from feeding every other week as well as regular watering, applying a mulch will maintain the moisture. French Beans are self pollinating, Runner Beans rely on Bees, plant some Sweet Peas amongst your Beans to encourage them to pollinate your flowers, they will look attractive and smell wonderful too. Pick your Beans as soon as they are ready, every other day is recommended, this will guarantee a long harvest, by allowing any beans to mature will stop new beans forming. French/Runner Beans are delicious eaten fresh but they can be stored in the fridge in a polythene bag for up to a week and are perfect for freezing to use later or if you have a glut. Beans are an ornamental vegetable; grow them on an obelisk or over an arch, they make an attractive feature in any garden why not grow them amongst your flowers, a row will form a dense and attractive screen. Why not grow your own Runner or French Beans? Sunflowers are one of the easiest flowers for children to grow and look stunning in any garden. If you want to explore the wildlife on the beach look no further than in a rockpool. Airplants are unusual, attractive and very easy to look after. Now is the time to start planning and planting your vegetable garden for the autumn, winter and spring so that you will be picking crops throughout the year. There are lots of fun things to do on the beach, why not get creative and make your own beach art? Why not create a Sensory Garden, with sensory plants and features that will bring it to life and stimulate all five of your amazing senses: Sight, Sound, Smell, Touch and Taste. Halloween may be a long time away but if you want to grow your own Halloween Pumpkin now is the time to get sowing. Why not grow your own potatoes this year? Last year was an exceptionally good year for fruit, if you want to grow your own now is the ideal time to start planning and planting. Autumn is here the nights are colder and the days are shorter, make the most of any pleasant Autumnal days in the garden. Autumn is a spectacular time of the year when leaves turn into amazing colours, they are very useful for many children?? ?s activities and can benefit the garden too. Tomatoes are healthy and truly delicious especially when they are home grown and freshly picked. August is the month to pick and enjoy your own home grown fruit and vegetables. Spring is well and truly with us and this month is one of the busiest in the garden. Although it may still be cold there are some things you can do in the garden. July is here and as the veg plot becomes a place of plenty (hopefully!) there has never been a busier time in the garden- read on to find out about the jobs that need doing this month! Following an enquiry from a day nursery in Weymouth, we have but together some advice for setting up a sensory garden. Great Ideas for Rainy Days! If you've never grown your own vegtables before or have limited space in your garden, why not consider using a raised bed?